The Sadari Movement Laboratory has taken on the task of creating a new dynamic interpretation of Georg Büchner’s play Woyzeck, one of the most enigmatic and influential works in modern theatre. Through a dynamic constellation of object, body, movement and space, this production generates a novel theatrical experience that illuminates the hidden potential of Büchner’s original work, while advancing a new language in physical theater. Using wooden chairs as a changeable metaphor, the performers both shape the dramatic space and reveal the characters’ emotional states, while the dynamic music of Astor Piazzolla’s tango becomes the throbbing pulse of the drama. This production of Woyzeck is a surprising and deeply moving theatrical event. 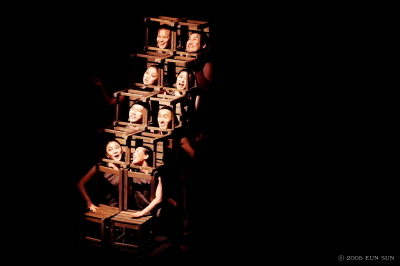 The work received multiple awards at the 2007 Edinburgh Fringe Festival, Edinburgh, UK, including the Total Theatre Award for Best Physical Performance, the Herald Angel Award, the BBC Top 10,2007 and Best Box-Office Record at Aurora Nova Theatre.